Director Steve Mitchell's documentary King Cohen chronicles the life, career and accomplishments of legendarily writer/producer/director Larry Cohen. The documentary recalls Cohen's early years in television, his transition into film with 1972's Bone, and the renegade reputation the independent filmmaker earned with such critical and/or commercial successes as Black Caesar, It's Alive, God Told Me To, The Private Files of J. Edgar Hoover, Q - The Winged Serpent, and The Stuff. Cohen also penned the screenplays for Best Seller, Maniac Cop, Guilty as Sin, Phone Booth, and Cellular. King Cohen premiered locally during last year's Fantastic Fest and will screen 4 p.m. July 21 and 1 p.m. July 22 at the Alamo South Lamar. The Larry Cohen-directed Special Effects will screen at 1 p.m. July 21 at the Alamo South Lamar as part of the Drafthouse’s Unhitched: Rip-offs and Homages to the Master of Suspense series. 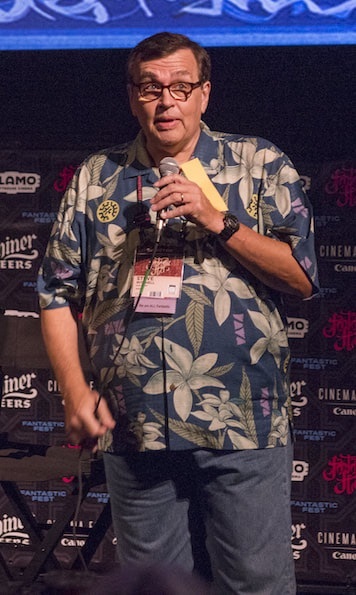 Director Steve Mitchell, who wrote the 1986 horror film Chopping Mall, discussed King Cohen during this year's Fantastic Fest.